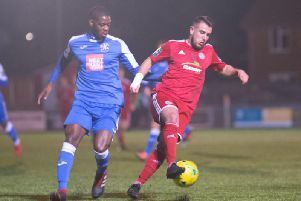 A goalless but far from chanceless game had just entered the 91st minute when, with Albion pressing from a corner, midfielder Josh Kerr seized on a knockdown and struck an immaculate low shot first-time across keeper Lewis Carey and into the bottom corner. Photographer Angela Brinkhurst was at the game, you can see a slideshow of her pictures above. It was harsh on a Rooks side who had not only battled hard, not only contained their gifted opponents, but actually dominated long spells of the action. There had been close calls at both ends, but not until that final decisive strike had the ebullient Carey looked like being beaten. The early phase belonged to Albion, centre-forward Stefan Ljubicic hammering a magnificent 30-yarder which left the Lewes crossbar shuddering, before winger Ryan Longman wastefully headed too high from a perfect left-wing cross. But Lewes held their own, realised that Brighton were mortal, and began to put together some incisive moves. Playmaker Omarr Lawson, at the heart of many good moves, saw one shot blocked and lively winger Kieron Pamment hit a lovely shot on the turn just too high as half-time approached. After the break, Lewes spent a full quarter-hour besieging the Albion goal. James Hammond’s goal-bound shot was scooped clear and Jonte Smith hit the rebound over the bar, but the young professionals were wilting, and full-back Joe Tomlinson was lucky to escape with an unpunished handball in the area. A succession of corners kept the pressure on, and from one, Lawson curled a sweet shot inches wide of the far post. Surely a goal would come? Yes – but at the wrong end. With extra time in touching distance, Kerr’s sizzler snatched it for Albion. Exhausted Rooks players crumpled to the ground, scarcely believing they had lost. If the young Seagulls go on from here to lift the trophy, they will surely look back on the Dripping Pan as the night that they really earned the Senior Cup.